Layered Defenses and Flexible Configuration Improve Server Performance and Security. 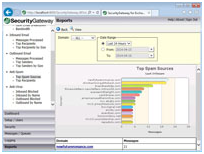 SecurityGateway for Email Servers offers simple and easy-to-use features to analyze, manage, and report on the inbound and outbound email traffic patterns of Microsoft Exchange Server or any other SMTP email server. 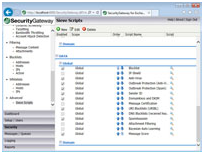 SecurityGateway incorporates multiple defense layers that deliver comprehensive protection at the edge of your network to prevent spam, phishing, viruses, and other threats to your email communications. 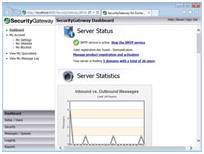 Built upon the industry standard Sieve mail filtering language, SecurityGateway for Email Servers offers performance and flexibility in managing inbound and outbound email traffic. 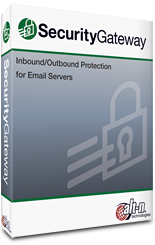 SecurityGateway performs a variety of security tests on inbound email messages, to block outside threats from gaining access to your system. Performing multiple tests on inbound messages helps ensure that spammers don’t have a single point of entry which they can exploit. SecurityGateway is an effective email security solution that not only blocks threats from outside of your network, but also from inside. 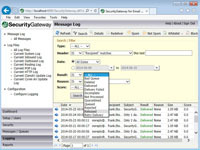 SecurityGateway’s data leak prevention and policy enforcement features help ensure that sensitive company data is safe. 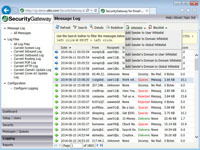 SecurityGateway provides detailed logs for administrators and users, showing the status of each email (delivered, quarantined, rejected) – and why it was rejected or quarantined. Its comprehensive reporting helps administrators identify mail traffic patterns and potential problems. These logs and reports provide an at-a-glance overview of email traffic, as well as antivirus and anti-spam activity. 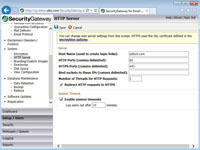 SecurityGateway for Email Servers is now licensed on an annual subscription model and includes technical support that is valid for 1 year (12 months) from the purchase date. 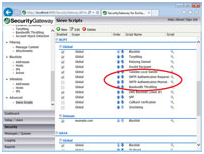 The ProtectionPlus add-on is no longer needed to add an additional layer of antivirus and spam protection to SecurityGateway, and has been discontinued. When upgrading to v.3.0 the installer will inform the user that it must automatically uninstall ProtectionPlus before proceeding. Please note that if upgrading from within the web interface, there is no opportunity for a prompt and that ProtectionPlus will be automatically uninstalled. Kaspersky AntiVirus integration, which was previously provided via the ProtectionPlus add-on, has been replaced with CYREN AntiVirus, which is now built into SecurityGateway. Dynamic Screening for failed SMTP authentication attempts now works across sessions over time. 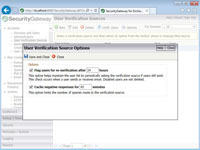 Previously, the failed authentication attempts had to occur within a single session. The failed authentication count for an IP is reset at midnight, or when it is blocked and added to the Dynamic Screening list. A “User Verification Source Options” page has been added, with options that allow response caching and user re-verification to be configured. When viewing the message log, administrators can now select “Released” as one of the search criteria. Exclusions can now be configured for attachment filtering. You now have the ability to exclude whitelisted senders, authenticated sessions, and domain mail servers from attachment filtering. 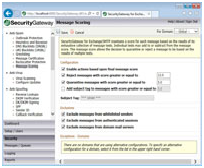 Messages in the quarantine can be fed to SecurityGateway’s Bayesian learning system to improve the spam fitler’s accuracy in detecting spam and non-spam messages. Added “Whitelist” and “Blacklist” button to the domain and global views. Domain administrators can add the sender to the recipient domain’s list. Global administrators can add the sender to the global list. The sender’s domain can now be added as a wildcard entry. Domain administrators can now add the sender to the recipient domain’s list. SecurityGateway.exe is now Large Address Aware, allowing it to use up to 4 GB of RAM on a 64-bit OS. Updated Firebird database engine to version 2.1.5. Updated ClamAV to version 0.98.